WeatherTek is a unique, scientifically tested system that can be applied to solid-walled buildings to limit the heat loss through the walls by keeping the fabric drier. WeatherTek is a simple one-coat cream application that dries colourless and will not affect the appearance of the masonry in any way. 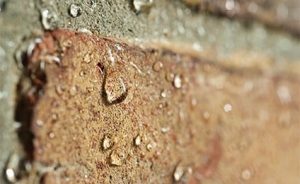 Effective on all unpainted or rendered brick, stone, concrete and pointing, WeatherTek lines the pores of the masonry preventing them from absorbing moisture, but vitally, leaving the pores open to allow vapours to pass through. On average, a property treated with WeatherTek can save up to 9% of heat energy per year, making the treatment an extremely cost-effective way of meeting carbon reduction targets and reducing energy bills. Click here for more information on WeatherTek from Timberwise or call us on 0800 046 6193 to discuss how we can help reduce your energy bills. Get Wallet-Friendly Walls for Winter!